Yawning May Promote Social Bonding Even Between Dogs And Humans : Shots - Health News Bears do it, bats do it. So do dogs and humans. They all yawn. It's a common behavior, but why is a bit of a mystery. Researchers think yawning may perk up the brain and help with social bonding. Turns out that humans aren't the only animals that contagiously yawn. "Yawning may have the dubious distinction of being the least understood common human behavior," Provine says. There are many causes for yawning. Boredom, sleepiness, hunger, anxiety and stress — all cause changes in brain chemistry, which can trigger a spontaneous yawn. But it's not clear what the yawn accomplishes. One possibility is the yawn perks you up by increasing heart rate, blood pressure and respiratory function. "[Yawning] stirs up our physiology and it plays an important role in shifting from one state to another," Provine says. When violinists get ready to go on stage to play a concerto, they often yawn, says Provine. So do Olympians right before a competition, or paratroopers getting ready to do their first jump. One study found that yawning has a similar impact on the brain as a dose of caffeine. But not all yawn researchers agree with this theory. "No specific arousing effect of yawning on the brain could be observed in at least five studies," says Adrian Guggisberg, a professor in the department of clinical neurosciences at the University of Geneva. Guggisberg and fellow researchers reviewed several theories of yawning and concluded that the arousal theory lacks evidence. What they did find were several studies that show yawning is highly contagious among humans, suggesting that "yawns might have a social and communicative function," Guggisberg said in an e-mail. Looking at yawns, hearing yawns, thinking about yawns or talking about yawns will likely trigger a contagious response. Contagious yawning may have evolved in early humans to boost social bonding, according to Provine. A good group yawn could serve to perk everyone up to be more vigilant about danger, he says. Another piece of evidence backing up the social bonding theory of yawning is a 2011 study by Ivan Norsicia and Elisabetta Palagi that found people are more likely to copy a yawn if they know the person who is yawning. A stranger's yawn is less likely to trigger a contagious response. And while babies yawn spontaneously, children don't engage in contagious yawning until about age 4 — around the same time they're becoming more socially connected. Now, what about other animals? We know that all vertebrates, critters with backbones, yawn spontaneously. But very few yawn contagiously. "Until the last few years, the feeling was that contagious yawning was unique to humans," Provine says. But recently, two more species have been added to the list of contagious yawners: dogs and chimpanzees. When two groups of chimpanzees were shown videos of familiar and unfamiliar chimps yawning, the group watching the chimps they knew engaged in more contagious yawning. This study, by Matthew Campbell and Frans de Waal, supports the theory that yawning plays a role in the evolution of social bonding and empathy. 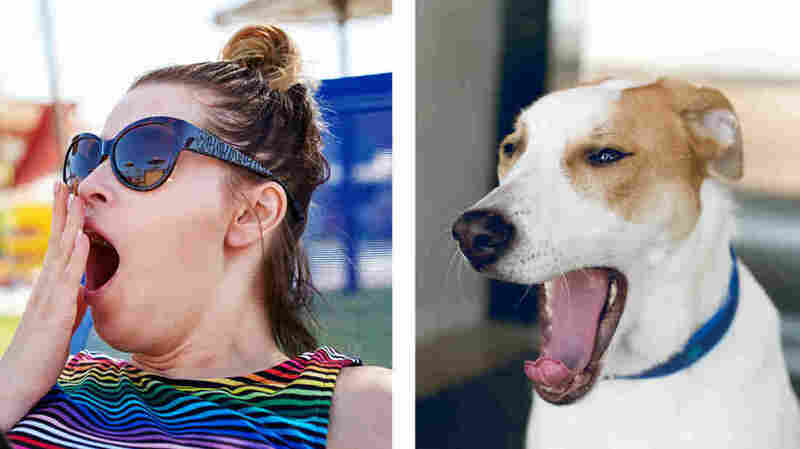 And dogs not only catch each others' yawns, they are susceptible to human yawning as well. In one study, 29 dogs watched a human yawning and 21 of them yawned as well — suggesting that interspecies yawning could help in dog-human communication.